Pala Ashwet Peki - Eagle House Mountain casts soft shadows. The light shimmers as if the present view is shifting the time and vision to the theme of this event: Honoring Traditions. August 15-16, on the banks of the Waniicha - river, circled by shady trees the 2nd annual Pala Pow wow open early and with great energy. The organizing committee of this Pala Pow wow thought carefully on the challenges from last years’ experience. This year they did all they could to make each and everything better. 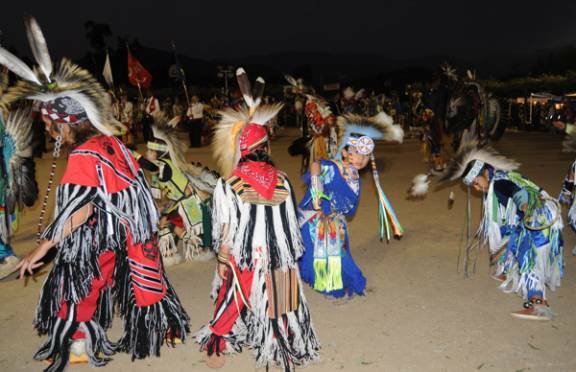 We appreciate Lourdes Sherwood for sharing these images of the Pala pow wow. Head dancers Sonia Flores and Kevin Yazzie led in the Grand entry for all sessions. Of particular note was the traditional Southern California North County singing. During the Pala Pow wow dinner break there was an exciting row of twenty or more youthful singers. These Bird songs and dancers are an outstanding way of Honoring Traditions and are completed by the very exciting female and male dancers. This year the Pala pow wow was extremely well attended by interested spectators. The dancers wore representative Tribal regalia. Equally appreciated were the young and experienced dancers. There were accomplished and exciting contest dance participants in all recognized and creative categories. 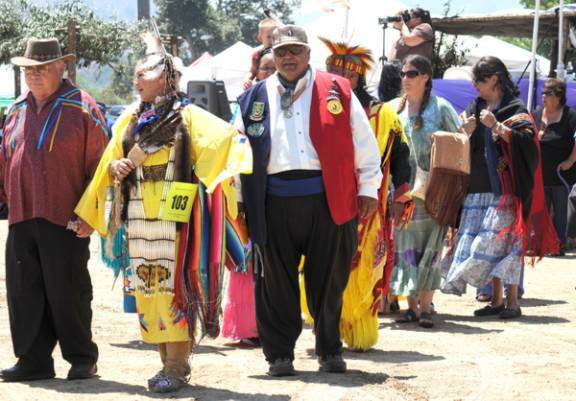 Hundreds of wonderful songs were sung this special Pala Pow wow weekend of Honoring Traditions. We were well informed, entertained and charmed by the Emcee, Ruben Little Head, a Northern Cheyenne from Lame Deer, Montana. Tribal Chairman Robert Smith presents the Pala Band official welcome. The host drum is from Alberta, Canada; Jacob Faithful leads Young Spirit. The Gourd dance was an open drum and the songs were sung by singers from San Diego and Los Angeles. The open gourd dance included Pala Veterans and the AIWA members. 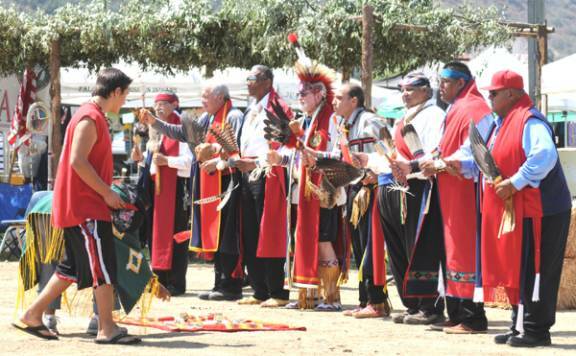 The San Diego American Indian Warriors Association, AIWA, was selected to be the Honor Color Guard again this year for the Pala Pow wow. AIWA was honored to have Captain David White Feather and Pala military veteran Ron Riggs join the Honor Guard and bring in the Pala Tribal Colors. Also, joining AIWA - HCG is Mr. Joe Morris, Dine’ USMC WW II Code Talker. 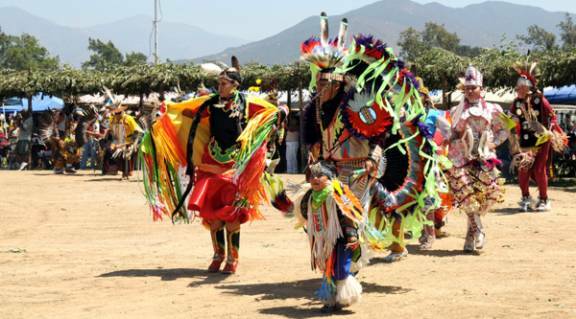 The Pala Pow wow is strongly supported by many dancers from the Soaring Eagles dance group. Three members are called upon to fill responsible positions as Pala Pow wow head staff: Jeanette Keeme. Adrian Ortiz and Kori Black Bear. The Soaring Eagles group is sponsored by: Southern California American Indian Resource, SCAIR. Organized by Vickie Gambala, SDUSD Indian Education and the Lead instructor is Edward ‘Chuck’ Cadotte. Our SCAIR Senior advisor is Randy Edmonds. Respectfully Randy Edmonds brought them into the Pala Pow wow arena in a traditional manner. We appreciate the tribe for their support and allowing time for this activity to be accomplished. We all appreciate the Pala Pow wow and the opportunity to share our Tribal culture with the Soaring Eagles.We also welcome this opportunity to contribute to the Pala Honoring Tradition Pow wow and the continuity of culture experience of our Indian children everywhere. Many thanks to Lourdes Sherwood for these great shots. Nice pictures, looks like it was a grand event for all.